Then sit back and enjoy your guests. 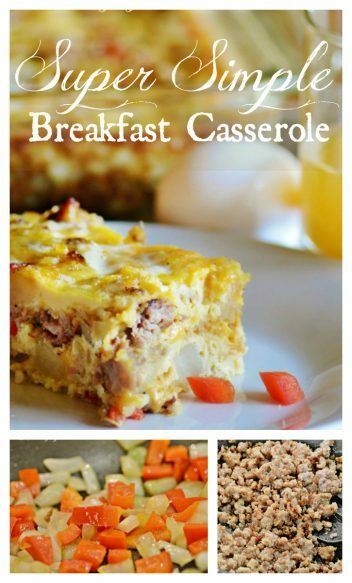 I love a good breakfast casserole and with this simple recipe, I make it ahead, slide it in the oven and I have a hot, hearty breakfast when everyone is ready to eat. Sleeping in and having brunch instead? – Perfect for that as well! Begin by browning your sausage and draining it. Sautee the onion and red peppers in the remaining sausage dripping until tender. 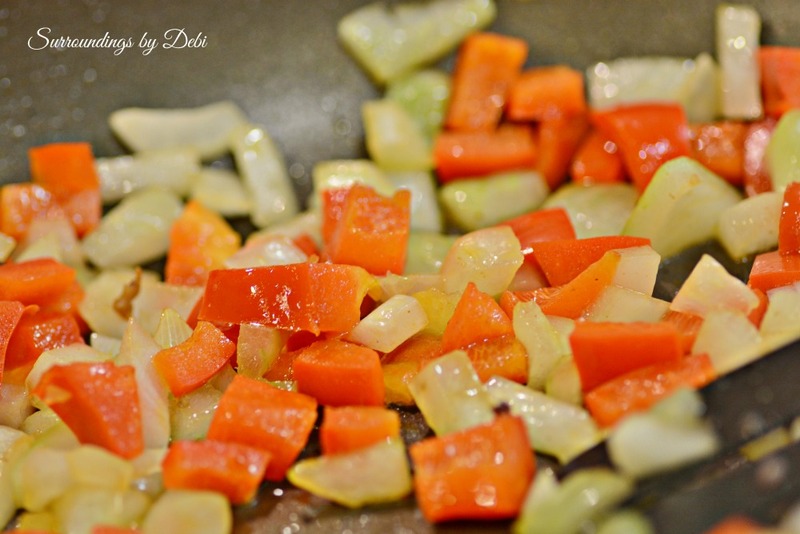 I love adding the red pepper to add just a bit of color to the casserole. Prepare the hash browns according to the package directions, using ½ teaspoon of salt and pepper. Once the potatoes have been cooked, I stir together the sausage, onion mixture and the shredded cheese and place it all in a lightly greased 9 X 13 inch baking dish. Stir together the eggs, milk and remaining teaspoon of salt and pour evenly over the sausage mixture. Bake at 350 degrees for 35 to 40 minutes or if you want, you can refrigerate overnight and bake in the morning. 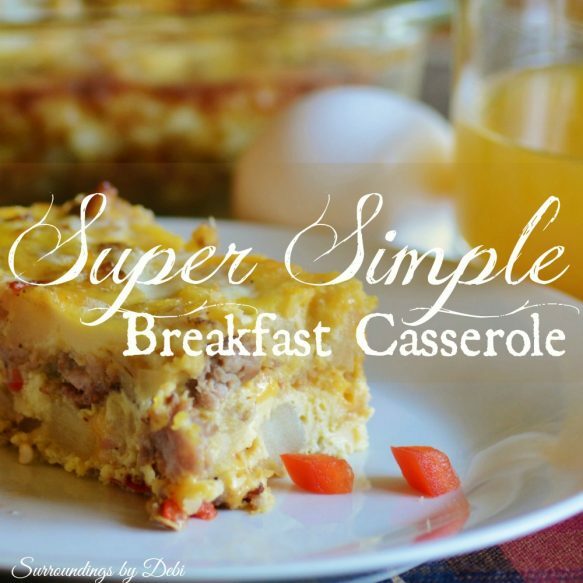 Delicious and what a super simple breakfast casserole! What’s your favorite go to recipe when overnight guests are coming? If you enjoyed this easy recipe, please take time to share it on your Pinterest board. You can see what I’m sharing HERE! 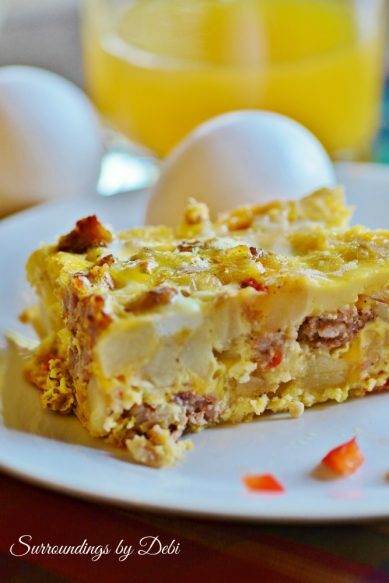 This is a super simple breakfast casserole that can be made ahead, refrigerated and baked in the morning. Cook sausage in a large skillet over medium-high heat, until no longer pink. Drain well. Add onion and red pepper to the sausage dripping and saute until tender. Prepare hash browns according to package directions, using ½ teaspoon salt and pepper. Stir together hash browns, sausage, onion, peppers and cheese. Pour into a lightly greased 13 x 9 inch baking dish. Whisk together eggs, milk, and remaining 1 teaspoon salt. 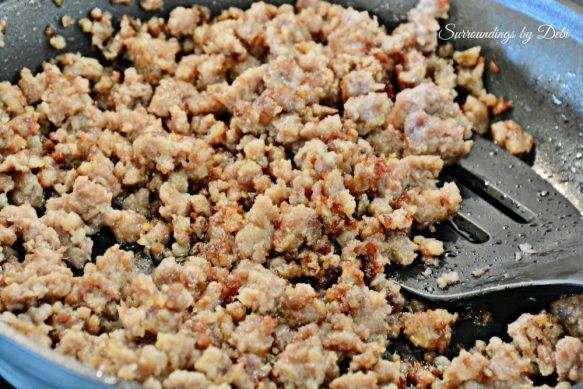 Pour evenly over sausage mixture. Wonderful Jerry. I hope you like it! Hope you enjoyed your feature at Full Plate Thursday this week and your new Red Plate. Have a great day and come back soon! Yummy!! I make something similar all the time!! Great Recipe!! I would love if you stopped by My 2 Favorite Things on Thursday – Link Party and share your stuff!! I’d love to have you!! It’s still open! 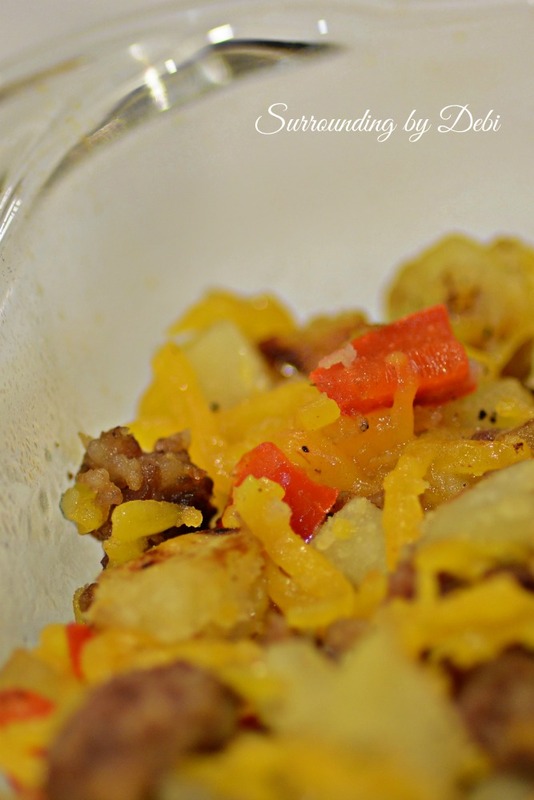 While I don’t eat casserole dishes, I love recipes like this for the family! And what an easy recipe. I enjoy the ones like this that are uncomplicated, look tasty and that everyone enjoys! Thanks so much for sharing this recipe! Have a wonderful day! Benita. I grew up on casseroles. 🙂 I just like all kinds of food I think! Have a great weekend! Pinning this! We need new breakfast ideas right now. It is yummy! Thank you for stopping by Tina! This looks delicious. 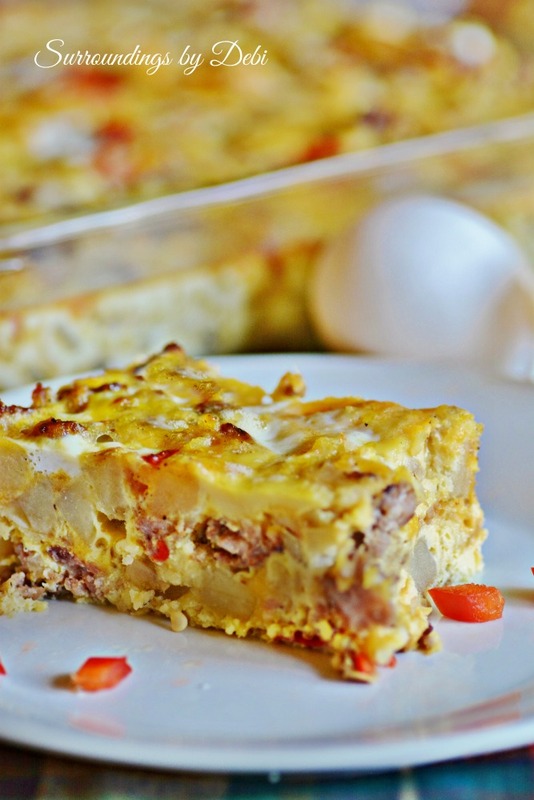 I love adding the hash browns to the casserole. Thank you Rosie! I hope you enjoy it! And you are thinking of Christmas already! I like that! Yum…sounds like a keeper. I love breakfast casseroles like this! Me too Pam! They are so easy and great to have when company is coming! Thanks for stopping by today! Have a great weekend.